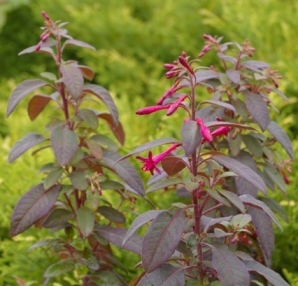 Joy Creek Photo Archive (c) all rights reserved Fuchsia 'Whiteknight's Cheeky' bears dark foliage and terminal clusters of small, mostly outward-facing trumpet flowers make this a readily identifiable beauty. The somewhat rounded leaves are bronze green fading to dark green. In certain lights, they almost look black. The fine hairs on the upper leaf surface give the foliage an irridescent quality. July to October. 1.5 ft. x 1.5 ft.